2016 Twitter power rankings: Trump’s CNN stunt works, while Cruz and Huckabee fight over Kim Davis. No, Governor, one. Former Virginia Gov. Jim Gilmore speaks during a rally against the Iran nuclear deal in Washington, D.C., on Sept. 9, 2015. It was a rare public appearance by the Republican long-shot candidate. Hello and welcome to Week 3 of the Slatest’s 2016 Twitter Power Rankings, where every Friday we round-up each of the White House hopeful’s most successful tweets from the past week. Why are we doing this? For starters, it will provide a helpful—if incomplete—snapshot of the topics that candidates are talking about online, and which of those are resonating with voters on social media. And, as the campaign continues to unfold online and off, it will also hopefully allow us to draw some conclusions about which candidates are winning the campaign Twitter wars and why. We need to pass pay equity for women workers. Equal pay for equal work.
.@HillaryClinton, "I'm sorry about that" isn't an acceptable response for putting your convenience above the safety of the American people. #LaborDay: We need to create a tax structure that incentivizes corporations to invest in our nation’s economy. The Donald won this week by tweeting a letter he sent to CNN asking the network to donate all of its profits from next week’s debate to various TBD veterans groups of Trump’s choosing. But while that letter was classic Trump—“this tremendous increase in viewer interest and advertising is due 100% to ‘Donald J. Trump’”—so too were the two dozen other tweets the GOP front-runner sent over the past seven days that also had enough retweets to earn the top spot in this week’s rankings, be it his dismissive retorts to Bobby Jindal, his mocking of Jeb Bush’s donor base, or the hyping of his own poll numbers. Anything else? Fighting over Kim Davis. The Kentucky county clerk and her anti-gay marriage crusade didn’t dominate this week’s rankings like they did the previous ones, but Davis still made the occasional cameo. Mike Huckabee made sure to be standing front and center when Davis was released from jail on Tuesday—and did everything he could to keep Ted Cruz out of the frame—but ultimately it was the rally-crashing Cruz who got the most mileage out of his “religious liberty” photo-op. Last thing: Can a former Virginia governor get a RT! 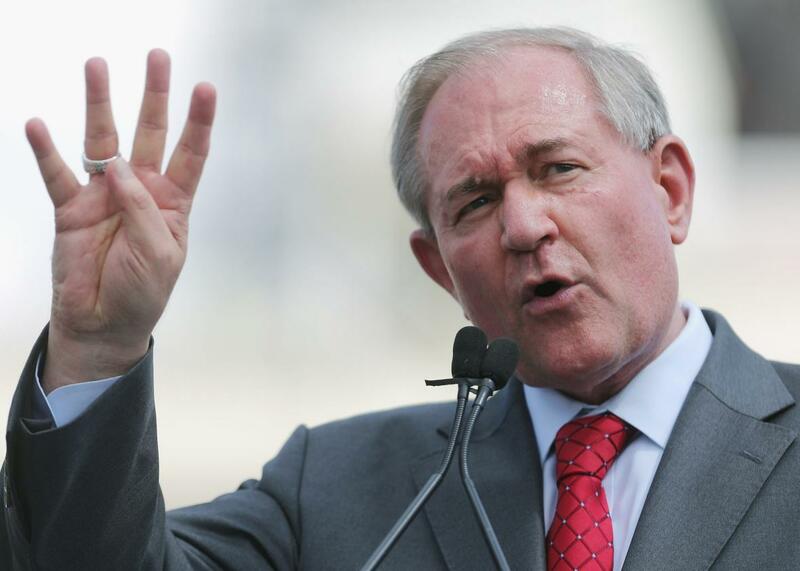 Jim Gilmore tweeted a total of 10 times between this past Saturday and this morning’s cutoff. His reward for his effort: a single, solitary retweet. (He’s since received a second but, again, and rules are rules.) Of course, that wasn’t the worst news the former governor’s campaign received this week. On Thursday, Gilmore learned that he failed to crack the 1-percent polling threshold needed to make it on stage next week for either of CNN’s two GOP debates. Maybe Gilmore can use the time he would have spent preparing for the debate to craft the perfect 140-character Trump insult. Either that or, you know, hold an actual campaign event.